Wellington, Fla. – April 3, 2019 – Ken Berkley & Scott Stewart of River’s Edge Farm are executive producers of a new documentary with HARRY & SNOWMAN and LIFE IN THE DOGHOUSE filmmaker, Ron Davis. The film, TO SERVE & PROTECT, will chronicle a paradigm shift in efforts by law enforcement through the Police Assisted Addiction Recovery Initiative (PAARI) to combat the national opioid epidemic in their local communities. Berkley, Stewart, and Davis intend to raise $1 million through tax-deductible donations to produce the film. “This is a crisis that has touched everyone in some way and incarceration is not working. Treatment is the only answer,” said Stewart. The producing team is hopeful that people will not only donate, but can interest friends, family, and organizations to contribute. Ibrahim Barazi and Omnia Incipit. Photo © Sportfot. Wellington, FL – February 14, 2019 – The sixth week of the 2019 Winter Equestrian Festival (WEF) features international jumpers at Equestrian Village and the hunters on center stage in the International Arena at Palm Beach International Equestrian Center in Wellington, FL. On Thursday, February 14, Ibrahim Barazi (JOR) took the top spot in the $36,000 Equinimity WEF Challenge Cup Round 6. In the $36,000 Equinimity WEF Challenge Cup Round 6, 61 entries went to post for a chance at prize money and the opportunity to compete in Friday night’s $134,000 CabanaCoast Grand Prix CSI 3*. There were 13 clear in the first round, and 10 of those chose to return for the jump-off. Scott Stewart swept both High Performance divisions during the start of WCHR Hunter Week at the 2019 Winter Equestrian Festival. The Antares High Performance Working Hunters kicked off competition Thursday morning in the E. R. Mische Grand Hunter Field where Stewart and Dr. Betsee Parker’s 11-year-old Warmblood gelding (Coriano), Cameo, won three out of four classes for the championship. Stewart then returned to the ring with Parker’s Private Life, an eight-year-old KWPN gelding by Verdi x Pinot Rosso). The pair wrapped up the High Performance Conformation Hunters with two firsts, a second, a third, and a fourth for the champion ribbon. Stewart continued his day by taking Champion in the Green Conformation Hunter with Scandal, a five-year-old Oldenburg gelding (Scandix x Ramira Gracia) owned by Gochman Sport Horses LLC. Reserve Champion went to Kelley Farmer and Me Too, a six-year-old mare owned by Larry Glefke. Celso Ariani and Ukulman de la Nutria. Photo © Sportfot. Brazil’s Celso Ariani won the first round of the Equinimity WEF Challenge Cup at Palm Beach International Equestrian Center in Wellington, FL on Thursday, January 10. With their share of $35,000 on the line, Ariani‘s mount Ukulman de la Nutria was fast across the ground and careful over the fences to top a six-horse jump-off over courses designed by Eric Hasbrouck of the United States. The pair will now focus on the $75,000 Rosenbaum PLLC Grand Prix, which takes center stage on Sunday, January 13. “He is from Mexico and it’s the system there to break them at five or six, but for some reason he was in pasture for a little longer,” said Ariani. “I was very happy with his results over the last year and I have a lot of expectations for him. I believe he can become a very important horse. Scott Stewart returned to the Winter Equestrian Festival in winning form as he secured the championship in the Equine Tack & Nutritionals Green Hunter 3’6” division during Week 1. Stewart piloted new mount, Bright Side, to an easy victory as the pair was awarded two firsts, a third, and a fourth over their courses. Stewart, of Flemington, NJ, is new to the eight-year-old Dutch Warmblood gelding (Ultimo x Tiara), who was purchased as an Adult Amateur 3’6” horse for his client, Stephanie Danhakl, only several weeks ago. Previously owned by Mountain View West Farm, LLC, the gelding has extensive Adult Amateur and Performance Hunter placings on the west coast. Photo: Scott Stewart and Lucador. The pair stayed true to their winning ways as Stewart, of River’s Edge Farm in Flemington, New Jersey and Wellington, Florida, secured the coveted Leading Hunter Rider Award for the 12th time in his career on Wednesday at the National Horse Show, while Lucador, owned by Dr. Betsee Parker, earned his fourth career and second consecutive Grand Champion Professional Hunter title. Horse-and-rider combinations awarded championships or reserve championships in their respective hunter divisions earlier in the week were eligible to compete in Friday’s $50,000 National Horse Show Hunter Classic, with participants competing at the respective height (3’6”, 3’9”, or 4’) of the section from which they qualified. Under the watchful eyes of two panels of judges consisting of James Clapperton, Daniel Robertshaw, Walter T. Kees, and Chance Arakelian, Friday’s first round course, designed by Bobby Murphy, welcomed 32 horses and riders to demonstrate their style and athleticism over obstacles composed of a variety of natural elements. Rounding out the top three was Amanda Steege of Ocala, Florida and Zara, owned by Frances Moppett, who were awarded scores of 86 and 84.5 for a cumulative tally of 170.5. Steege and Stewart were the only two entries to qualify two mounts in the handy round. Stewart also rode Dr. Parker’s Private Life to an 11th place finish, while Steege piloted Cheryl Olsten’s Lafitte De Muze to seventh place. Over the course of the two days of competition, Rockette garnered first place in the under saddle and stake class and third place in the over fences and handy classes to secure championship honors in the Gochman Family Large Junior 16-17 Hunter division, in addition to the Cantitoe Farm Challenge Trophy. Adding another accolade to their growing collection, Allen and Rockette also earned the “Inclusive” Perpetual Cup, chosen by the judges as the best performers of the group from both the Large Junior 15 and Under Hunter and Large Junior 16-17 Hunter stake classes. Photo: Darragh Kenny and Babalou 41. Lexington, Ky. – May 10, 2018 – The Rolex Stadium welcomed its first evening event of the Kentucky Spring Horse Shows with the opener of the seven-part Hagyard Challenge Series, the $35,000 Hagyard Lexington Classic CSI3*, sponsored by Hagyard Equine Medical Institute. Out of a substantial starting list of 53 horse-and-rider combinations, it was Darragh Kenny (IRL) who emerged triumphant, riding Jack Snyder’s Babalou 41 to the fastest double-clear finish in 44.22 seconds. Stewart and Harvard Hall captured the award by acquiring the most points from competing, and earning champion, in the Green Conformation Hunters. On Wednesday, the pair claimed first place in both over fences classes with scores of 87 and 81 in addition to first place in the under saddle portion of competition. They continued to dominate Thursday’s Green Conformation Hunters with scores in the 80s. Stewart and the 7-year-old KWPN gelding, Harvard Hall, have proven themselves to be a great team, having won numerous champion titles during the 2018 Winter Equestrian Festival (WEF) in Wellington, Florida. Harvard Hall was purchased by Dr. Betsee Parker in the beginning of the 2018 WEF circuit. Photo: Todd Minikus and Quality Girl. Lexington, Ky. – May 9, 2018 – The first day of competition at the Kentucky Spring Horse Show kicked off in exciting fashion at the Kentucky Horse Park where the Rolex Stadium highlighted the $35,000 Welcome Speed 1.45m CSI3* with 27 entries contesting Alan Wade’s (IRL) 15-effort track resulting in 11 clear rounds. Racing to an impressive and unbeatable clear round, Todd Minikus (USA) and the Quality Group’s Quality Girl claimed the lead by over three seconds with a time of 65.24 seconds to earn the victory. With an extensive list of accolades to her name including the Zoetis $1 Million Grand Prix in Saugerties in 2014, the Elm Rock Farm Trophy at the inaugural Global Champions Tour of Miami Beach in 2015 and a clean sweep with three FEI victories at the Kentucky Spring Classic in 2016, Quality Girl is a proven winner. After nearly a year off, Minikus took his time bringing the 15-year-old Oldenburg mare back to the show ring and it paid off. Second place was awarded to Samuel Parot (CHI) and his own 15-year-old Belgian Warmblood gelding, Couscous Van Orti, with a clear round and a time of 68.85 seconds. Hot on Parot’s heels in 69.22 seconds was Kevin Babington (IRL) and his own Mark Q, a 16-year-old Irish Sport Horse gelding. Earlier in the day, the Green Hunter Incentive Program took place in the Stonelea Ring at the Kentucky Horse Park. Twenty-one horse and rider combinations competed in the 3’6” and 3’9” sections of the Green Hunters for top honors and it was Scott Stewart and Fashion Farm’s Playbook that executed a flawless round at the 3’6” fence height. Second place was claimed by another veteran hunter rider, Kelley Farmer and Exceptional, owned by Todd Minikus. Havens Schatt and Diatendro captured third place in the class. Stewart is coming off of a successful season at the Winter Equestrian Festival (WEF) in Wellington, Fla. with consistent champion titles in the High Performance Hunters and the Green Conformation Hunters. Stewart has also had great success in the Green Incentive Program, having won the championship title three times, most recently in 2017 with Playbook. The Green Hunter Incentive Program was created by the USHJA in the hopes of increasing participation at the Green level. This year, the program introduced the option for athletes to compete at the 3’6” and 3’9” height in order to attract even more entries. At the end of the year, the top placing horse and rider combinations will be invited to return to the Kentucky Horse Park to compete at the Green Hunter Incentive Championships in August at the Bluegrass Festival Horse Show, which will include four fence height options upon adding the 3’6″ and 3’9″ to the existing 3′ and 3’3″ fence heights. Carly Hoft and Available Ohio. Photo by Shawn McMillen Photography. WASHINGTON – October 25, 2017 – The 59th annual Washington International Horse Show (WIHS) continued on Wednesday, October 25, with the second day of competition featuring the $10,000 WIHS Children’s and $10,000 WIHS Adult Jumper Championships, the awarding of the professional and amateur-owner hunter championships, and the $10,000 International Jumper speed class. The first jumper victory of the 2017 WIHS went to 18-year-old Carly Hoft of Raleigh, NC who rode Available Ohio to the win in the $10,000 WIHS Children’s Jumper Championship. From a starting field of 25 entries, six advanced to the jump-off, and only Hoft and Available Ohio produced a double clear round, taking the win in a time of 32.158 seconds. Jumpers this week are competing over courses designed by Alan Wade of Ireland, who designed the 2017 Longines FEI World Cup™ Jumping Final. Finishing in second were Isabel Harbour of Alpharetta, GA and her mount Camera Ready, owned by Fit to Print Farm. Hoft was presented with the H. Fenwick Kollock Memorial Perpetual Trophy for her win. Hoft has had Available Ohio for a year and a half and has come to count on him as her trusted partner. Hoft will also compete in Lindsay Maxwell Charitable Fund WIHS Equitation Finals on Saturday, October 28, before heading back to Auburn University where she is a freshman on the school’s National Collegiate Equestrian Association (NCEA) team. Paige Kouimanis (20) of Clarence, NY and Lexus were victorious in the $10,000 WIHS Adult Jumper Championships. Out of a starting field of 26, they were the only clear round out of ten in the jump-off to win with a time of 35.876 seconds. For the tenth time in his career, Scott Stewart of Wellington, FL was named the WIHS Leading Hunter Rider after winning both the Grand Green Hunter Championship with Wonderly and the Grand Hunter Championship with Private Life. Stewart and Private Life, a six-year-old Dutch Warmblood gelding (by Verdi) owned by Dr. Betsee Parker, swept all three of the Green Conformation Hunter over fences classes to take the division championship and ultimately the Grand Hunter Championship. Stewart and Private Life were presented with the Rave Review Challenge Trophy, donated by Stoney Hill, for the championship victory. Stewart acquired Private Life from Morgan Ward two years ago after seeing great potential in the horse and being struck by both his personality and his jump. Stewart’s second grand championship of the day came aboard Wonderly, an eight-year-old Brandenburger gelding (by Burberry) also owned by Parker. Stewart and Wonderly earned the Grand Green Hunter Championship after finishing first, second, and third in the Green Hunter 3’6” over fences classes and earning the Green Hunter 3’6” championship. For the Grand Green Hunter Championship, Stewart and Wonderly were presented with the Claire Lang Miller Challenge Trophy as the high point combination from all of the Green Hunter divisions. Finishing as the reserve champions behind Stewart in both the Green Conformation Hunters and the Green Hunter 3’6” were Leslie Steele of Calabasas, CA and Top Shelf, owned by Milissa Summer. Before concluding his time at WIHS, Stewart also earned two reserve championships, first in the High Performance Hunter division with Cameo, owned by Parker, and next in the High Performance Conformation Hunters with Lucador, also owned by Parker. Earning the championship in the High Performance Hunters was In the Know, ridden by Samantha Schaefer of Westminster, MD and owned by Madeline Schaefer. In the High Performance Conformation Hunters, Boss, ridden by John French of Paso Robles, CA and owned by Laura Wasserman, took the top honors. The Leading Amateur-Owner Hunter 3’6” Rider award and the Frank Counselman Memorial Perpetual Trophy for the Grand Amateur-Owner Hunter 3’6” Championship were presented to Lindsay Maxwell of Beverly Hills, CA and her own Technicolor. The pair came into the day without a ribbon in the first over fences class, but they rose to the occasion to win both of Wednesday’s Amateur-Owner 35 & Under Hunter classes before also being named the division champions. This year marks Maxwell’s second time competing at WIHS, and this year, she’s also joined in support of the horse show as the sponsor of the Lindsay Maxwell Charitable Fund WIHS Equitation Finals. Finishing as the reserve champions of the Amateur-Owner 35 & Under Hunters were Nikki Diamantis of Tallahassee, FL and her own Cascina. The Amateur-Owner Over 35 Hunter Championship went to Emily Morin of McLean, VA and her own Ace of Spades, while the reserve championship was presented to Kirsten Pollin of Washington, D.C. riding her own Incognito. In the Amateur-Owner Hunter 3’3” divisions, the grand championship was awarded to Virginia Fout and her own Carma for the second consecutive year. Fout topped two over fences class and the under saddle to win the Amateur-Owner Over 35 Hunter 3’3” division championship and to take the grand championship. For her grand championship win, Fout was presented with the inaugural Bucky Reynolds Memorial Award, sponsored by Ernie Oare and Reynolds’s sister, Betty Oare. Winning the trophy in honor of Reynolds, who passed away earlier this year, made the grand championship honor extra special for Fout. While Fout originally hails from nearby Middleburg, VA, she now resides in Los Angeles, CA, where she owns and operates the event management compaNY V Productions. The reserve championship in the Amateur-Owner Over 35 Hunter 3’3” division was awarded to Lynn Seithel of Charleston, SC and Walk The Moon. The Amateur-Owner 18-35 Hunter 3’3” championship went to Kaitlin Porath of Charlotte, NC and her own Breaux, and the reserve championship went home to Tallahassee, FL with Lindsey Phipps and her own Reign. Devon, Pa. – May 31, 2017 – Scott Stewart of Wellington, Florida has been coming to the Devon Horse Show for many years to compete in the professional hunter divisions, but despite winning at the event countless times, the prestige of coming to the historic horse show and earning the Devon Leading Hunter Rider award continues to be a special accomplishment for him. Ladies Day at the Devon Horse Show and County Fair featured a long-standing tradition: the Ladies Side Saddle championship. The hunter hack and over fences classes were featured in the Dixon Oval during the day on Wednesday, and competitors returned later in the evening to compete under the lights for the final under saddle class before pinning the champion. Ultimately, the True Blue Challenge Trophy was awarded to Gillian Beale King and Natalie Peterson’s Alta Mira. 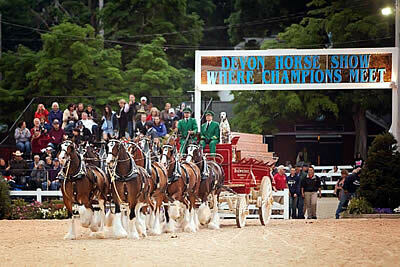 The world-famous Budweiser Clydesdales will be performing at the Devon Horse Show and Country Fair on Friday, June 2, and Saturday, June 3, weather permitting. The Clydesdales will parade around the Dixon Oval, pulling the Budweiser wagon with the signature Dalmatian dog riding along. The hitch that will be performing at Devon this year comes from Merrimack, New Hampshire and there are 10 Clydesdales with the crew. Eight horses go out on the hitch each day, with two resting per day. The New Hampshire hitch is one of three traveling hitches, while the other two are based out of Colorado and Missouri. This hitch travels 10 months out of the year and they will stay at Devon until the final day of the show. From here, the hitch goes back to New Hampshire to rest before heading back out on the road to perform in York, Pennsylvania and Johnstown, Pennsylvania. This year, while the “East Coast Hitch,” as they are commonly known, has been at Devon, they have also been attending other events in the area. On Memorial Day, the crew went to the Pottstown Memorial Day Parade. The day before, they attended an event in Media. The hitch has been taking single horses out to Anheuser-Busch distributors as well. The Budweiser Clydesdales have a storied history. Anheuser-Busch first acquired a hitch of Clydesdales when August Busch Jr. gave them to his father, August Sr., as a gift to celebrate the repeal of Prohibition. The Clydesdales went on a tour of the United States to thank those who had made the repeal possible, and they have been traveling across the nation ever since. The Clydesdales are known as ‘gentle giants.’ On average, they each weigh 2,000 pounds and are 18 hands tall, which is approximately 6 feet. All of the Budweiser Clydesdales are similarly marked, with a bay coat, black mane, white blazes down the nose and white legs. In just one day, the Clydesdales eat about 40 pounds of hay and drink between 25 and 30 gallons of water, which is in addition to a portion of grain each day. The hay and bedding for all of Budweiser’s 150 Clydesdales comes from one farm. The wagon that is a part of this hitch dates back to the 1900s and weighs 9,000 pounds. The Dalmatian who rides on the wagon is another Budweiser trademark and each hitch has at least one. The Dalmatians used to help watch the hitch back when the Clydesdales were used for deliveries. They would run on the side of the wagon and protect the products. The Dalmatians have been traveling to performances with the Clydesdales since the 1950s. “We are thrilled to have the Budweiser Clydesdales come to Devon – ‘Where Champions Meet.’ Our spectators are thrilled to have them perform and all of us from Devon are proud to have them as our guest. A big thank you goes to Anheuser Busch and Penn Distributors for their help in getting this exhibition to Devon,” said Rich O’Donnell, Devon Horse Show president.